Well my guess is that our own Sheldon Lee feels like this is a step in the right direction. Sony announced that they will be releasing a digital comic reader in November for the PSP and Marvel Comics will be one of the companies supplying them with titles. The titles will be limited to classic books and back issues though. This news is good for one reason only: it shows that Marvel is at least acknowledging the world of digital downloads outside of anything on their website. Other than that, this project is going to crash and burn like the Hindenburg (yeah that’s right, old school metaphors). For those of you that don’t know what a PSP is, it’s a gaming device that is about 3 x 4 inches aka prime real estate for comic book reading, right? Here’s how I think this meeting went. Marvel Guy 1: Hey let’s put Secret Wars and the X-Men storyline ‘Fatal Attractions’ on the PSP for people to read. Marvel Guy 2: That is a certifiably badass idea. Marvel Guy 3: You’ve done it again MG1. Marvel Guy 4: Sometimes I think you are the third coming of Stan Lee. 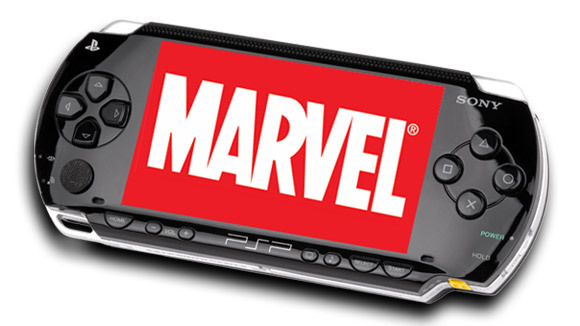 Marvel Guy 5: Wait, the PSP is like 4 inches wide. How is anyone going to be able to see the full panels much less read the words? Marvel Guy 1: Look, no one questions MG1. Let’s do this! And scene. Sony and Marvel, best friends forever.